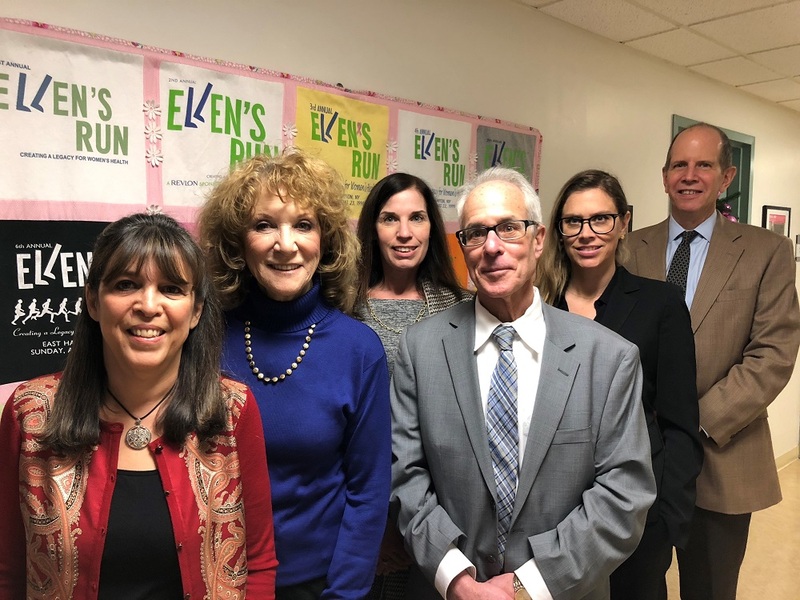 The Ellen Hermanson Foundation met with Stony Brook Southampton officials last week to present hundreds of thousands in grant money to the hospital's Ellen Hermanson Breast Centes, Ellen's Well, and the Phillips Family Cancer Center. Photo courtesy of Stony Brook Southampton Hospital. The Ellen Hermanson Foundation announced last week that more than a quarter of a million dollars in money raised will benefit cancer patients at Stony Brook Southampton Hospital. Not only will $285,000 go toward the Ellen Hermanson Breast Centers and Ellen’s Well, a program that provides psychosocial support to breast and gynecological cancer survivors, but it will also be used at the Phillips Family Cancer Center, which is scheduled to open later this year in Southampton. The foundation has kept true to a promise made in 1996, when Ellen’s Run, its signature 5K race, started, to keep the money raised on the East End. “We see our job as to make sure that the latest technology is always there so that the breast center is competitive with any breast center in the country,” Julie Ratner, the foundation’s president, said by phone on Tuesday. Ms. Ratner, with her family, founded the organization after her sister died in 1995 at the age of 42. Since 1997, the foundation has given $4 million in grants to promote mammography, help buy state-of-the-art equipment that helps promote early detection, and offer comprehensive services for breast cancer patients and their families from diagnosis to end-of-life care. Money is raised through several events, including the popular Ellen’s Run. No patients are turned away from the breast center for lack of insurance or inability to pay for treatments, and Ellen’s Well services, established in 2000, are free of charge. The foundation has also helped establish the hospital’s breast centers in Hampton Bays and East Hampton. As part of the grant, the foundation is underwriting the $85,000 cost of a Leica Mammotome Expert Biopsy Suite, which will offer the most advanced technology available in the operating room. It enables surgeons and radiologists to access and examine specimens without leaving the operating room. No longer will specimens collected during biopsies have to be transferred to another location to be analyzed. The foundation is also providing funding for a Hologic Affirm Prone Breast Biopsy System that uses three-dimensional imaging to facilitate the biopsy process. Despite improvements in treatment and accessibility to care on the East End, women are still dying from breast cancer, and the need is still great, Ms. Ratner said. Though the numbers are decreasing, more than 40,000 women die from the disease per year in the United States, and about one in eight women will develop invasive breast cancer in their lifetimes. Programs and services offered through the Ellen Hermanson Breast Center and Ellen’s Well are mammograms, ultrasounds, and M.R.I.s for uninsured women, an oncological social worker, retreats, nutritional counseling, transportation assistance, reflexology during chemotherapy, massage and acupuncture therapy, yoga, water exercise, and strength training. This year, the foundation is providing funding for three chemotherapy infusion chairs, which will make treatments more comfortable, to complete its pledge of 10 chairs for the Phillips Family Cancer Center, Ms. Ratner said. Each costs $10,000. The foundation began supporting the center after Ms. Ratner attended a groundbreaking ceremony for the County Road 39 building last year. “It is a gift,” she said of having a state-of-the-art cancer center on the South Fork so patients don’t have to travel to Riverhead, Memorial Sloan Kettering’s outpost in Commack, Stony Brook, or even Manhattan. As the center opens, Ms. Ratner said, there will be other needs, and the foundation is open to hearing proposals for grant money.